NEW! 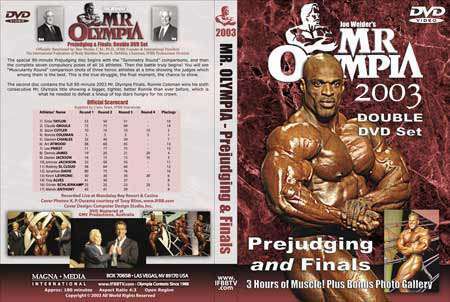 First-ever DVD version of the Olympia! As a 2 DVD Set! *Special DOUBLE DVD set 3 Hours of Muscle! 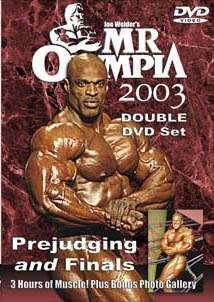 PLUS The 90-minute Finals DVD with the individual posing routines of every athlete, an appearance by Arnold Schwarzenegger, award presentations, and Ronnie Coleman’s victory speech. This entire production was digitally remastered and authored for Magna Media International by GMV Productions using the world’s best available equipment, color enhanced and lighting adjusted for the best presentation of bodybuilding. The packaging includes the official scorecard.